As I come to the end of my tenure here at “Izzy’s,” I return to the theme of my very first “Musings,” namely Art (the visual arts). Last summer I wrote two pieces on the faceted glass windows, which were very well received. I discovered later that the way I described these windows was pretty much the way the artist himself had described them on these pages back when he made the windows, circa 1988, just over 30 years ago—but he was more succinct than me! His name is Jim Hopfensperger. He gave us a great gift! I had hoped to meet the artist. When I googled the name, I got a professor of art history at Western Michigan. It turns out that he is the artist’s son. We exchanged emails. He told me that unfortunately, his artist father is now over 90, and suffers from pretty severe dementia. Every chance I got, I showed off these windows to people and helped them to see what is going on in them, both artistically and symbolically. One day I showed the front windows, the creation theme, to a friend of mine from St. Paul of Tarsus. As I guided him through the images, his eyes began to tear up. It was such a powerful spiritual experience for him that he could not even look at the rest of the windows at that time. He said he would like to come back later to see the other windows. 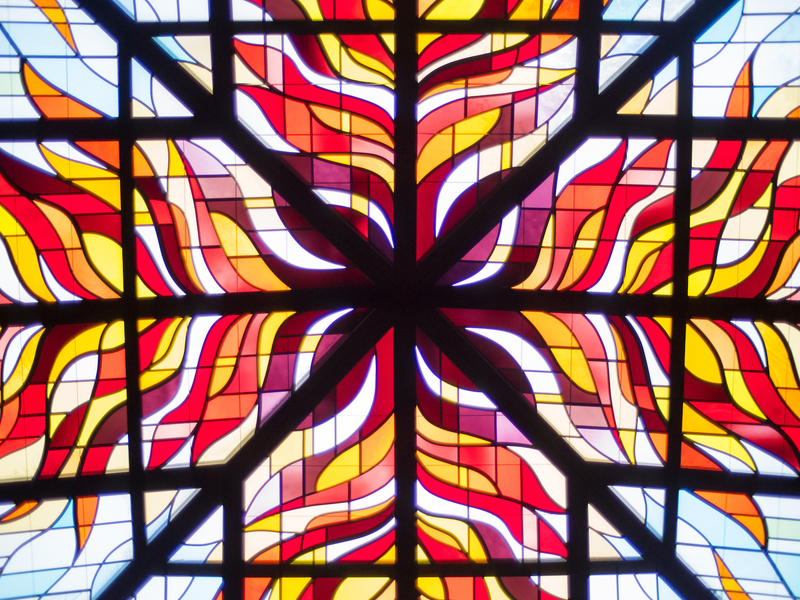 By the way, Ron Pakizer tells me that the other faceted glass windows, along with the flaming kaleidoscopic skylight in the Holy Spirit wing, were installed much later, around 2006. This work was done by Liturgical Environments of Hayward, WI a company run by Jerry Krauski and his daughter Annette. While the design of that work is much more symmetrical than Mr. Hopfensperger’s work, which is very fitting for that space, they are exciting in their own way, and they harmonized these windows very beautifully with the earlier ones. One piece of unfinished business is the wing on the opposite side, which is quite drab. It seems that nothing has really been done in that area artistically, which is a real shame, since the rest of the church, inside and out, is so beautiful. One possible improvement might be as simple as moving the stations of the cross from the Holy Spirit wing to that space. 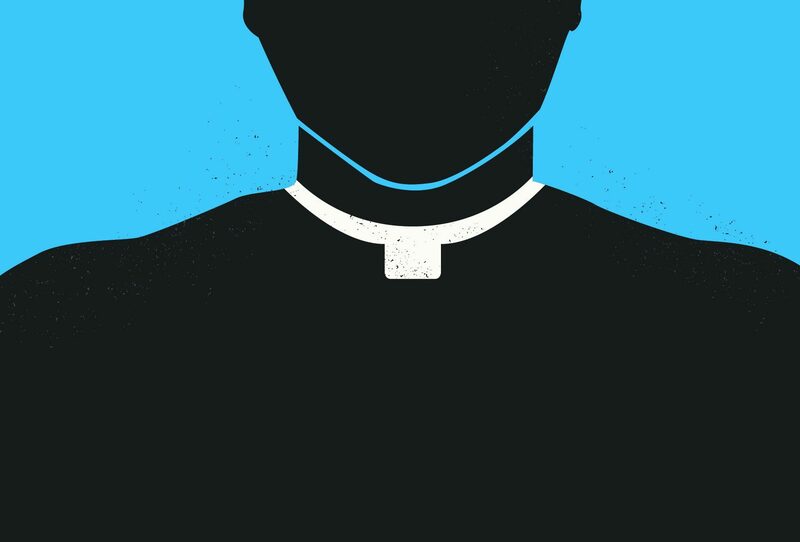 I believe the stations would be more appropriate on that side, since they don’t really fit the Holy Spirit theme where they are presently. As long as I am freely expressing my artistic opinions as a lame duck, I have another wish. The large traditional cross that is mounted on the front wall is very beautiful—I suspect it came from some earlier church. However, it clashes stylistically with the windows around it, and would look better in a different space. I would love to see in its place a more modern metal sculpture corpus, at least as big as the cross that is there now, if not bigger, employing the same sort of free-flowing lines as we see in the windows. In next week’s bulletin, my last written words here, I will talk about my own art work.